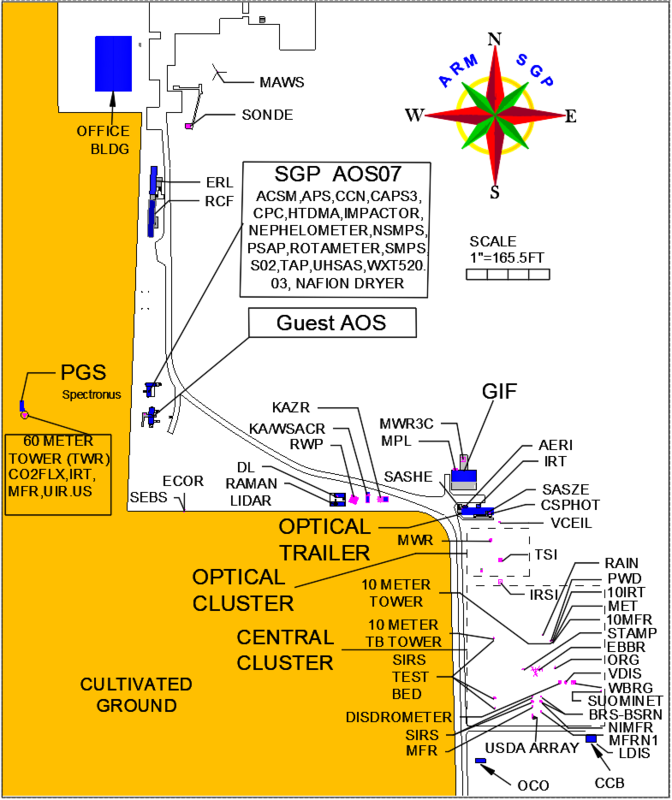 The Southern Great Plains (SGP) atmospheric observatory was the first field measurement site established by the Atmospheric Radiation Measurement (ARM) user facility. This observatory is the world’s largest and most extensive climate research facility. Scientists use data from the SGP to learn about cloud, aerosol, and atmospheric processes, which in turn leads to improvements in models of the Earth’s climate. The SGP observatory consists of in situ and remote-sensing instrument clusters arrayed across approximately 9,000 square miles in north-central Oklahoma and south Kansas. Located on 160 acres of cattle pasture and wheat fields, the heart of the SGP observatory is the heavily instrumented Central Facility southeast of Lamont, Oklahoma. Technicians, along with support staff and observers, monitor data from the Central Facility instruments and from smaller, unstaffed facilities throughout the site. The SGP site offers high-quality data and simulations for atmospheric scientists to use. Data are used in a variety of ways from single observation analyses, to multi-observation process studies, to assimilation into earth system models. Researchers supplement the continuous observations with guest instruments during field research campaigns or by requesting increases in the frequency of measurements, such as sonde launches. ARM transmits all data gathered at the SGP to the ARM Data Center and they are made freely available via Data Discovery. In addition to taking measurements, ARM recently began building data sets that can be incorporated into atmospheric models. These data are used in large-eddy simulation (LES) models, which simulate atmospheric air currents and cloud processes, to provide context and a self-consistent representation of the atmosphere surrounding the SGP. The LES ARM Symbiotic Simulation and Observation (LASSO) workflow is the pilot project developing a framework to offer modeling capabilities alongside instrument data.